Articles, on average, consist of 500 words and are an excellent way for business owners to begin growing their websites. Articles provide brief information regarding a specific topic so that customers and audience members alike can become more educated with just a simple read! Articles are also a great way for business owners to take up much more space on the internet and to increase their probability of appearing at the top of almost any search results by any search engine. By taking up more space on the internet and showing up first during search results a business (and a business owner) can dramatically increase not only their fan base but also their monthly and annual revenue! Blogs too provide a reader with brief adequate information regarding any topic. However, blogs have their own way of delivering an informational message to a reader so that the reader can become interested as well as educated. Business owners who continue to publish blogs on a daily basis will attract not only a larger audience but also a larger customer database. This is because in the today’s internet world videos and instant messaging have become lightning fast! This also means that information received must also keep up with this lightning fast speed so that the reader (and potential customer) does not become bored and drift away from the service. Business owners will find that investing in blogs as well as articles will attract a larger audience and help to keep them interested at all times! As mentioned on the Home Page, I provide a business and a business owner with weekly and monthly status updates for whichever social network corresponds to their business. This is perfect and very useful for the ultra busy business owner or business owners who cannot delegate hours of their time on social networking sites. Social networking sites such as Facebook, Twitter, Tumbler, and Linkedin help business owners grow awareness regarding their business and also help them to reach out to a MUCH larger customer database. A business owner will grow their monthly revenue dramatically the more status updates are conducted on a day-to-day or week-to-week basis. Whether for business or for personal sometimes people just need some personalized content written up! This includes people who are working on their own books or novels and don’t have the time to sit down and type through the night or even those who need some additional assistance with their resumes and cover letters. Whatever it may be, just contact us and find out how we can help you and your needs. 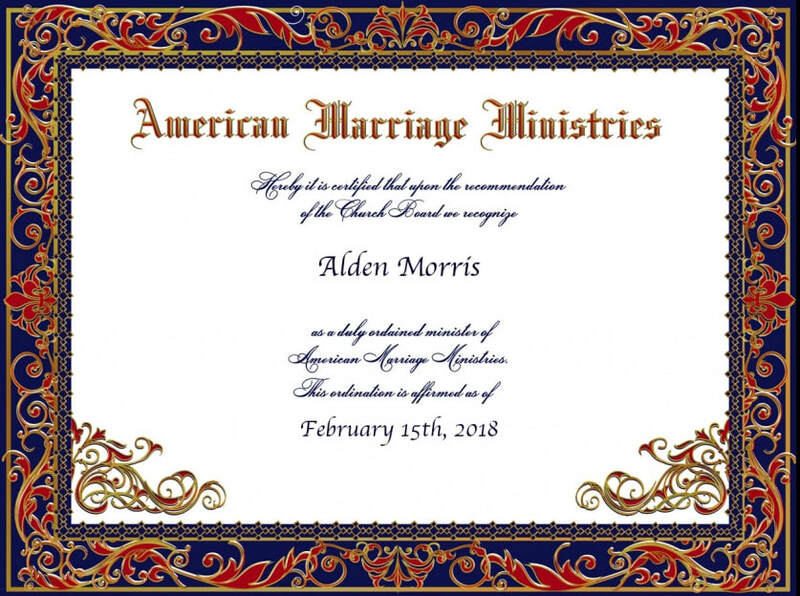 As an ordained minister; Alden Morris is authorized to officiate weddings in Washington State. All people regardless of race, gender, sexual orientation, have the right to marry - it is also the right of the couple to choose who should solemnize their marriage. Although in Washington State there are no legal requirements to officiate a wedding; a certification recognized by the Church board of the American Marriage Ministries located in Seattle, WA is provided below.